However, this author has always personally felt the word ‘assurance’ was too close to ‘insurance’ or ‘ensurance,’ implying a guarantee the documents are free of defects. In my experience and opinion, this is impossible to achieve (despite this article’s title). I tend to prefer the use of the term ‘quality control,’ which will be the terminology employed for this article. I received my first lesson in quality control during my first job out of college. For my first project, my supervisor asked me to select exterior colors for an office addition to a paper factory. I thought this was going to be pretty easy, since the company colors were canary yellow, poppy red, and royal blue. I marked up a print of the exterior elevations with the three colors, coordinating with those previously selected for the paper factory itself. Coordination among disciplines is best accomplished in a meeting. makes adjustments in the process to strive for continued improvement. This concept becomes a bit more difficult when you apply it to design professionals—architects and engineers have more than one product. We provide a service to our clients, we produce documents by which the bricks and mortar are laid, and we help produce the end product: the buildings in which people live, learn, play, worship, and work. Controlling quality is important for both obvious reasons like creating consistent, coordinated, and complete CDs to obtain bids within a narrow range and limiting change orders and liability, as well as less-obvious ones like providing professional development opportunities to current colleagues and attracting new staff members. This article is focused on the construction documents (CDs) product, but I hope it is obvious the quality of service to clients and the quality of the final building are inextricably tied to the quality of the CDs. Production standards are important because they are the basis for consistent CDs, regardless of who in your firm (or outside it, in the case of outsourced production) creates them. Ensuring quality can include a review of detail appropriateness for project conditions. I had the opportunity to lead the updating of Callison Architecture’s production standards in the early 1980s in Seattle. 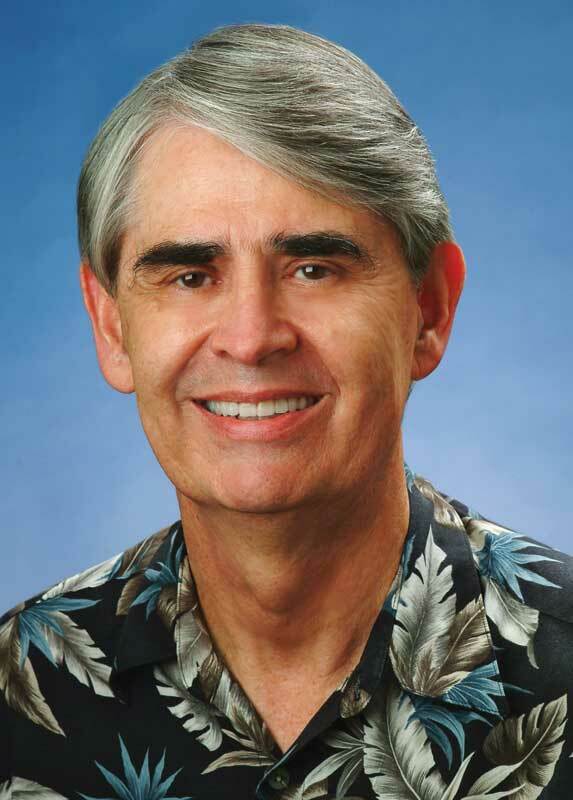 I was also on the Honolulu Chapter of the American Institute of Architects’ (AIA’s) Production Office Procedures (POPs) committee to update standards in 1987, and led the updating of Architects Hawaii Ltd.’s (AHL) production manual in the early 1990s. My research during these updates reinforced my belief in the importance of consistent CDs. There are several production standards your firm can use as a basis for creating your own, including the U.S. National CAD Standards (NCS). In some cases, your client may require you to follow its standard. Either way, the advantages of consistency can be seen with the following examples. Always dimensioning to the same side of a wall or partition limits the possibility of misaligned walls. This can be especially true of concrete masonry unit (CMU) walls, where nominal dimensions are usually used, but the 9.5-mm (3⁄8-in.) difference (or 19 mm [3⁄4 in.] if two walls are included) can be significant for elements such as elevator shafts and stair shafts using manufactured steel stairs. 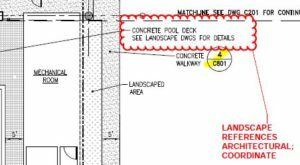 Always using the correct terminology for construction materials limits the possibility of contractor misinterpretations and potential change orders. This terminology aspect became even more evident as I began writing specifications for AHL in the late 1980s, and then doing the office portion of contract administration (CA) on projects. There are industry-standard terms for construction materials and assemblies that should be employed to avoid discrepancies. When you use a term to describe something on the drawings, the same term should be used in the specification. 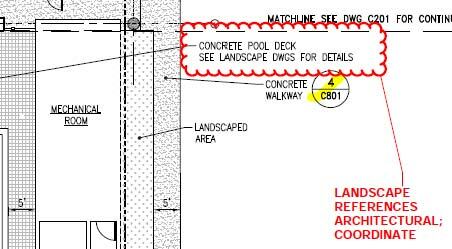 Always using the same abbreviations for construction materials and terms helps avoid discrepancies. 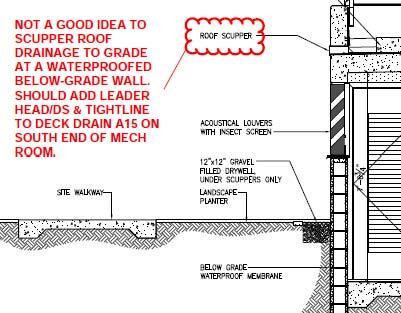 Always using generic material terminology on the drawings allows you to schedule which material should be used in which condition in the specifications. Employing nonproprietary terminology can be advantageous for this reason. An example is “sheet metal flashing”—if more than one kind of sheet metal is used, it is usually easier and clearer to schedule their individual locations in the specification, rather than calling out the kind of material on the drawings. It is also much easier to change a material in one location by an addendum to the specifications, rather than trying to catch all the locations where it is noted on the drawings.